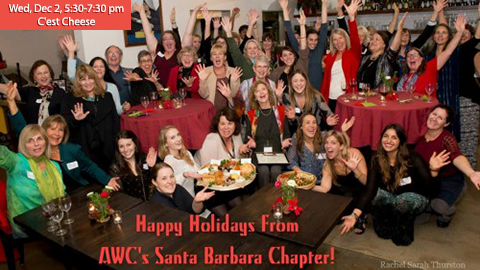 Start the holiday season off by celebrating with AWC-SB at our annual holiday party. By tradition we will honor our Nonprofit of the Year, which for 2015 is Villa Majella. Come enjoy holiday cheer with other communicators and refreshments from C’est Cheese. Please join us to find out what other surprises we have in store for the evening. Villa Majella has provided shelter to women, 18 years old and over, in crisis pregnancy since 1982. The women come from various situations such as homelessness, domestic violence, drug history, incarceration etc.. Once pregnant these women develop courage to pull themselves out of their circomstances and, despite the odds, decide to give their babies life. Whether that means parenting their child or placing for adoption. Villa Majella offers a safe loving environment in which these women take a look at their lives and make changes where needed. In housing the mother and caring for her in all aspects mental, emotional, and physical, their staff affects the future of the unborn child. Villa Majella offers 24-hour staff, parenting, early infant care, self-esteem, one-on-one counseling, life skills, daily case management, and pre-natal care.Over this past year the nonprofit has assisted fifteen women and welcomed five babies into the world. Please bring a gift for Villa Majella clients. Suggested items include hair products, lotions, soaps, nail polish, gift cards for haircuts, spa services, clothing stores or restaurants. This entry was posted in Past Events on November 19, 2015 by Lisa.